There are a wide variety of waterproofing systems out there, each with its pros and cons. If you want to do it on the cheap, you can double bag your gear in garbage bags. Use bags marketed for yard waste, as they are heavier duty than the regular ones. Tie each bag separately and then put them inside a duffel bag or knapsack to protect the garbage bags. One small prick or tear and the whole system will fail. Used olive barrels have become popular in the canoeing community for waterproofing gear. They are available at Greek or Italian restaurants and markets. They used to be free, but these places are on to us and now charge a small fee for them. Or, you can buy a barrel of olives and get the barrel for free! Occasionally the O-ring on these barrels is ruined in opening, but removing the old ring, cleaning the grove and laying down a small bead of silicon caulking will fix it. 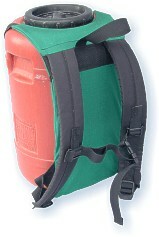 Drybags come in a huge variety of shapes and sizes. Most use a roll down system to seal them and keep water out. Be sure that the material is flat when rolling. Any crease will allow water to work its way inside. Others seal with waterproof zippers. While more expensive, they are easy and quick to use. Dry boxes are extremely durable but more expensive than other options. Most dry boxes seen on the water are used to protect expensive items like your camera or vital gear such as the first aid kit. They use an O-ring to seal out the elements and are extremely dry. Every time you close the box, be sure to check the seal for cuts or debris. A single hair or a small accumulation of dirt can foul the O-ring enough to let water inside. I use all of the above systems from time to time, but when canoeing my favourite waterproofing piece is the big blue barrel. They hold 70 to 75 litres of stuff and fit perfectly two abreast in a canoe.